You’re in accounting, not PR. Getting the word out about what your firm has to offer is possibly not your strong suit, or it’s something you just don’t want to spend a lot of time puzzling out. Today we’d like to highlight how outsourced accounting services can course-correct some errors you might be making in marketing your firm. Firms, especially smaller and newer firms, have to spend an extraordinary amount of time, money, and effort in order to expand, or even just to shore up enough in-house talent to keep up with a current heavy workload. The problem is that these firms haven’t yet had the chance to build the reputation of the monster accounting firms (be they domestic or international). The big guns in the business can afford to have a “they’ll come to us” position regarding the cream of the talent pool crop. But chances are your firm can’t float the same attitude. Outsourced accounting services help you change your focus. Instead of spending all that money and time trying to market your company to potential hires (in the hopes of beating out big firms to the best pickings) you could be working, making money, and spending your marketing time and money on pulling in new clients. 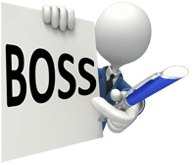 You tell BOSS what you need from your workers and your assigned BOSS managers will dip into our deep pool of trained and certified accountants and come up with exactly the talent you need. Your work will be done to the same quality standards you would get out of any in-house talent, and you’ve wasted next to no time or marketing money on headhunting. Added bonus – you also don’t have to pay all the overhead that comes from bringing a new person in to your physical location. First of all, if your firm doesn’t have a website it needs one, pronto. Not having a website for your business is the equivalent of not having a phone book entry 25 years ago. Once you do acquire a website and put some effort into fixing it up to draw traffic and convert visitors into customers you’re going to run into a term – SEO. This stands for Search Engine Optimisation and at its most basic level it means tweaking your site’s content to show up higher in a search engine’s (Google being the biggest search engine by far) results page. The higher you show up, the more business you get. It will come as no surprise that there is a nasty side to SEO, just like pretty well anything else on the internet. This is where outsourced accounting services can help you. Part of the SEO world is called Black Hat SEO, and amongst other things, it includes instances of where your competition sets up a smear campaign against you online. For example, they pay some people to write negative reviews of your firm and post them online. It doesn’t matter if the reviews are true, they just have to be believed. And just like that, your reputation is in the mud. One of the best ways to counter this kind of attack is to have an excellent backlog of customer relations. The more happy customers you have, the more people will come to your defence online of their own accord – a kind of grass roots bulwark against a smear campaign. You already know how to build that golden reputation – excellent customer service. The question is, are you able to maintain a fantastic level of service for all of your clients? If you’re falling behind in your workload, those bulwarks get lower and lower. Outsourced accounting services help you keep ahead of your work. Even better, they can help you expand the menu of services you offer, making your firm that much more valuable in the eyes of your clientele. Having a website for your firm is essential; so is making sure the marketing attached to the website has a strong foundation. Not everyone likes self-promotion. It can feel awkward. How can outsourced accounting services help you spread the good word about your firm? This ties into the previous point – use outsourced accounting services to both broaden the range of services you have to offer and to make sure your work gets turned around on time and at the highest level of quality. Become your clients’ one-stop-shop. They’ll appreciate not having to truck their various accounts to different firms for different services. Next, ask for recommendations. Plant those recommendations on your website. Now it’s not you trumpeting your services – it’s your clients. If self-promotion still makes you uncomfortable, think of it like this – you’re not patting yourself on the back; instead you’re making a promise of excellent service. The recommendations are not flattery; rather they’re evidence that you keep those promises. Which brings us to our last point. Your reputation is your business. Nothing mentioned in the points above is going to help your firm if word gets out that you can’t deliver. So make sure you can deliver. On time. With the highest level of quality. Outsourced accounting services are the most cost-efficient method possible to make that happen.